SideSwiper Net -- SSN: W1SFR's keys. Homebrew TBK, Torsion Bar Key. 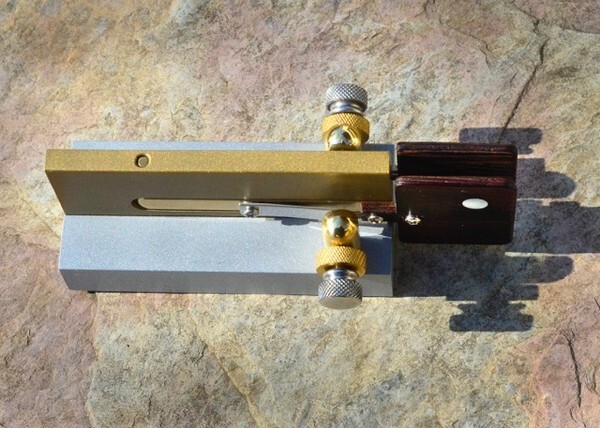 Homebrew i-KeyYa, portable Torsion Bar Sideswiper. 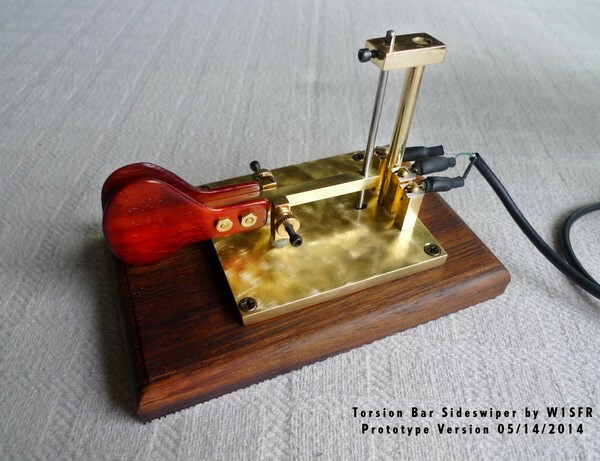 Homebrew TBP, Torsion Bar Portable Key. 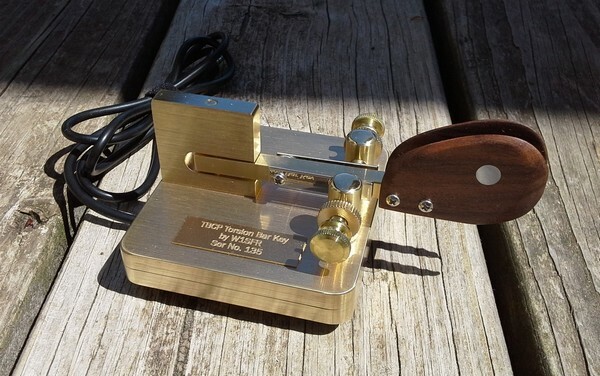 Homebrew TBCP, Torsion Bar Cootie/Paddle Key. 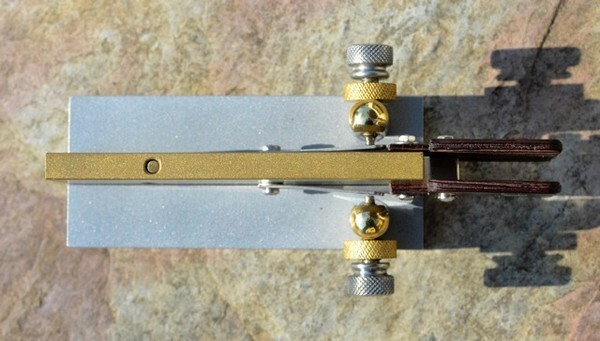 The Torsion Bar Key (referred to as the TBK) is a design for a single-lever paddle developed by Tom Leary W0VTP and published in the December 1982 issue of QST. I first saw this key on KA8OQF's SSN page and thought that the design and function were very intriguing...I had to try it. 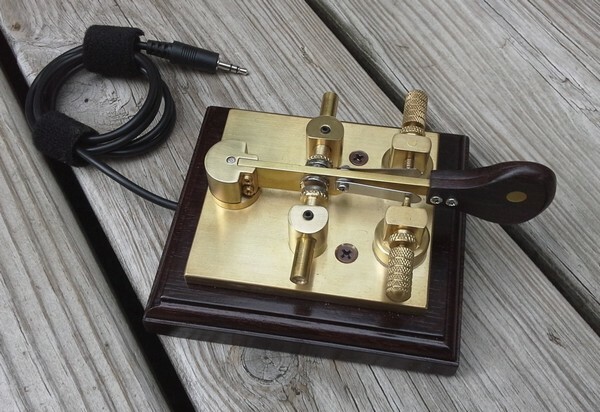 Single lever keys in general are quite versatile and can be used in several different ways. You can use them as a traditional paddle, as a sideswiper and even as a straight key (or at least sound like a straight key). I'm finding that more and more it's my preferred way of sending CW. I guess the primary attraction for me is that they sound more "personal". You can actually create inflection in your "voice" using a sideswiper...unlike any other key. You can slow down to a crawl or go as fast as your fingers will allow...it's all up to you. The construction of the key was done with only the most basic shop tools. I was quick to learn and appreciate the true meaning of "perfectly square" and was challenged on all fronts. Upright posts are made from 1/4" round and square rod. The torsion bar itself is made from 1/8" drill rod. 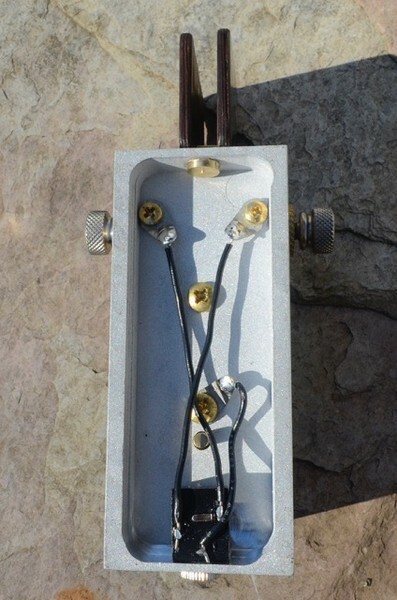 Contacts are made underneath the brass base using nylon inserts in the holes leading to the contact posts to isolate the screws from the base as well as nylon washers on the bottom of the posts to maintain their isolation. Thin strips of plastic material were used underneath with brass strips on top to make the contact between the posts in the rear and the contact posts at the paddle position. The brass base is 3" x 4" and the teak wooden base measures 4" x 6" and is finished with Danish oil. The action is pretty amazing and the torsion bar keeps the paddle arm perfectly centered yet only thousandths from the contact screw tips. It's a true testament to the ingenious use of a simple concept. You can find a PDF of the original article by Tom Leary, W0VTP in the December 1982 issue of QST which you can find on the ARRL website. 73, Steve. [W1SFR]. You can order a hand made/hand finished TBKII (Torsion Bar Key II) from KX3Helper.com. As you know I've been building torsion bar keys and they have turned out to be awesome swipers. I had a "Twanger" and really liked the action which is what led me to start building keys in the first place. Lately I decided to build a key out of scraps around the shop and never having built a key utilizing a bearing post, I thought I would give it a go. The attached picture is the result. My first version was using a Delrin bearing and that simply didn't work for two reasons, I used quite small magnets which couldn't overcome the friction of the delrin "bearing". I know some of you are rolling your eyes right now, HiHi. I also used a stiffer contact material with silver rivet contacts. Well they looked real pretty, but didn't have the flex I've been used to with my other keys. My third fix was to create new contact strips using thinner stainless steel without the silver contacts. I just spent some time on the air just now, and I'm happy that it now is very close in feel to the TBKII. Although the magnets are doing their job, I would still like them to be more powerful, but I'm going to leave well enough alone. I wired it to be used as a paddle as well if wanted, but it's built as a swiper and I'm very happy with the results. The base is made from a solid piece of ebony that I've been saving. It's literally hard as a rock and machines like steel. I had to dull the edges with sandpaper before finishing, it was so sharp! [W1SFR]. Here is a still photo of my new key. I haven't decided if I am going to produce them to sell, but I really like the design and the action is really great. I don't think I'm going to part with this one any time soon. The base is milled black ebony and the finger pieces are also ebony milled very thin. The torsion bar is less than 1'' long. My first try was a complete failure. I thought that using a softer metal for the torsion bar would allow it to twist enough to provide the action needed, but it didn't budge. I managed to come up with a way to machine the torsion bar to allow it to twist just enough to make it work without going too far and deforming the torsion bar. [W1SFR]. Here are some pictures of my new "TBP" Torsion Bar-Portable, the step child of my "i-Key-Ya". It makes a really fine swiper and has just enough mass to keep it from moving around much when used. I just keep a couple of fingers on it while I use it. Here's the copy from the page on my website. My first run is only 10 keys at $175 so I'm trying to keep the price down so more folks will try swipery as their CW mode of choice. Of course it also works FB as a single lever paddle. 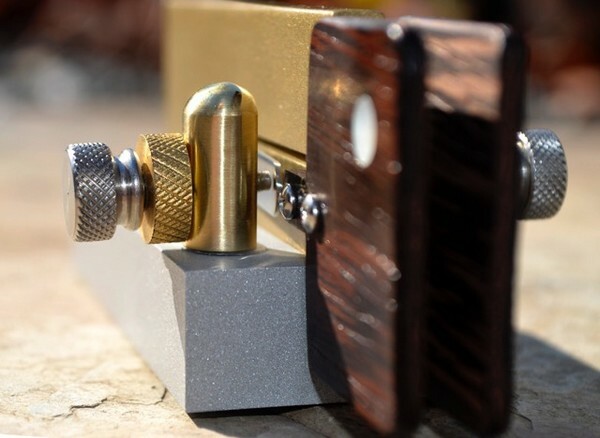 It's an entirely new design... a Portable Torsion Bar Key. 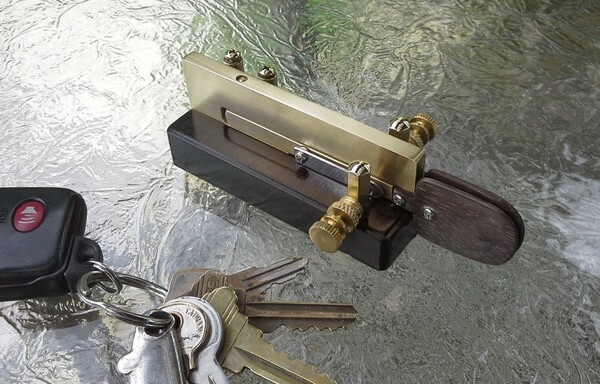 In an effort to build an inexpensive and portable single lever key that looks great and functions like no other, I've designed an all new key. 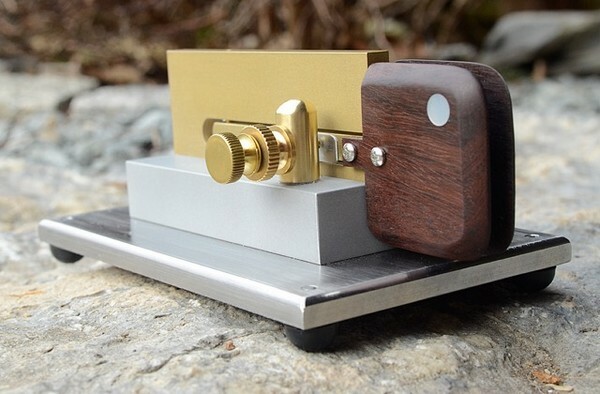 One that you'll be proud to own and use on your next portable outing or at home in the shack. It features a patent pending design that allows effortless sending that's smooth and quiet all wrapped up in a very small package. The base is milled out of a solid block of Aluminum. The control lever "carrier" is brass and the hand-shaped finger pieces are made of rare woods with my signature Mother-Of-Pearl dot on each side. Base and lever carrier are glass bead blasted and lacquered. 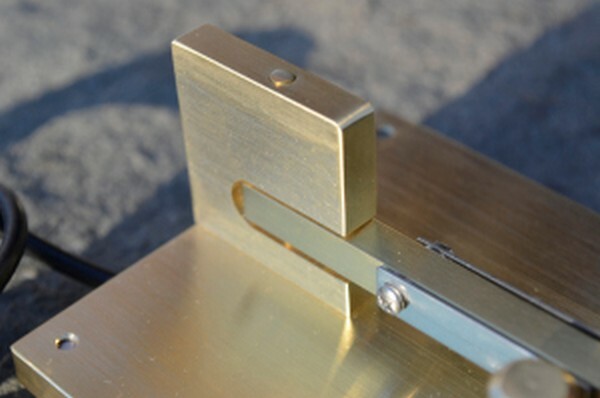 the lever and posts are brushed/polished finish and the adjustment screws are 10-32 fine thread Stainless Steel. The contact strip is also stainless steel and provides a quieting mechanism that makes the key virtually silent while in use. The combination of the torsion bar "suspension" and the "soft landing" contact system makes this a truly unique key. Dimensions are 3.5L x 1.5W x 1.75H. Weight is 9oz. The key is supplied with a 3.5mm cable and 2 non-slip pads. First run will be only 10 keys at the price of only $175 + 12.00 priority mail shipping. Drop me an email for estimated delivery dates. NEW!! Torsion Bar Portable Key With Base V2.0. VERSION 2 IS HERE WHICH INCLUDES A STAINLESS STEEL BASE FOR HOME USE!! Scroll down and check out the video! Please note that this stainless base is not compatible with Version one keys. A Totally New Design. Same great action and feel... Tension is set to only 25gm so you only need a very light touch. 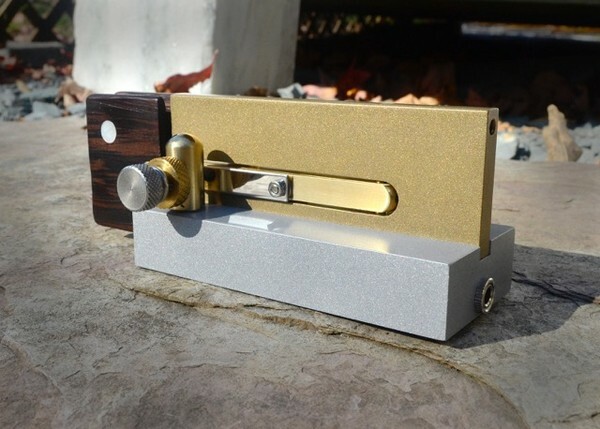 Key WITH stainless steel base is only $225 + 12.50 Priority Mail shipping. Delivery time is around 2 weeks depending on backlog, etc. International orders are welcome. Please inquire about shipping rates to your Country/Province. Further details on my website. As many of you know, I'm a huge fan of the cootie key or sideswiper. I've been using one for years and all of my keys can easily be used as either a paddle or cootie. 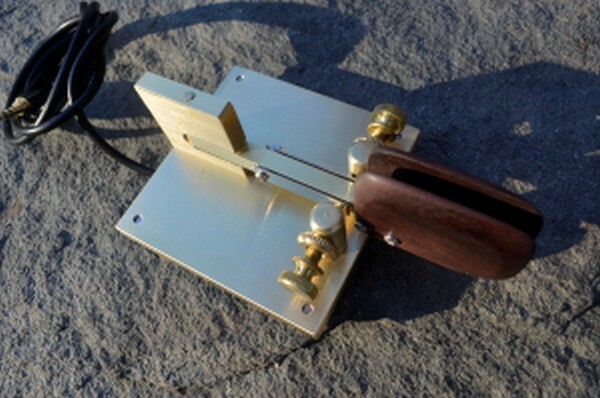 Knowing that cootie keys are not the most popular way of sending CW, I've set out to produce a key that is wired as a paddle but is equally at home as a cootie, and most of all, it's very affordable. It features my exclusive Torsion Bar action and hand rubbed and finished exotic wood finger pieces. With a simple stereo to mono adapter (which is included), you can switch back and forth from a classic paddle to a cootie quickly and easily. 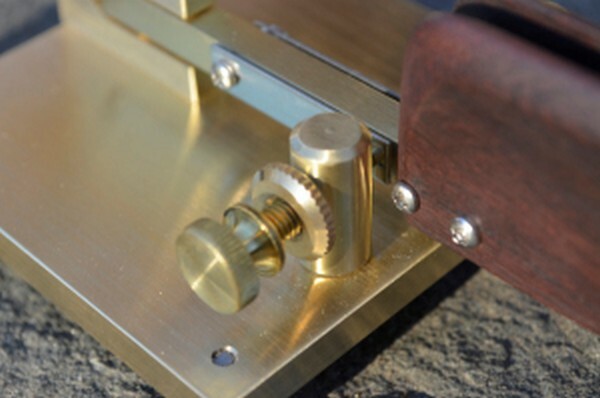 The key is all fine brushed brass and has enough mass (even though it only has a footprint of 3''x3'') to stay put in use thanks to the rubber feet. A 3.5mm cable is included as well as a hex key for adjustment should you drop it on the deck while you're reaching for your coffee. Handmade with great care, this key will last a lifetime. Delivery can take up to two weeks, but I usually can get a key out the door in a week or less. Keys are sent via USPS Priority Mail and professionally packed to ensure safe delivery. TBCP (Torsion Bar Cootie/Paddle) $148 + $12.50 USPS Priority Mail Shipping. Drop me an email for estimated delivery dates or visit the TBCP page. [W1SFR]. Here is my "Fat" version of my cootie paddle. I have simply doubled the 1/4" base and now will offer it up in a 1/2" version...for those that just can't seem to help slapping the poor thing all about HiHi. This picture shows a prototype with a double layer of 1/4" brass, but new ones will be solid 1/2" bases. I toyed with the idea of putting the jack in the base, but didn't want to mill any of the brass out so I could leave all of the weight in the base. Order a TBKII (Torsion Bar Key II) from KX3Helper.com. Order a TBP (Torsion Bar Portable Key) from KX3Helper.com. Page updated on October 11, 2018.